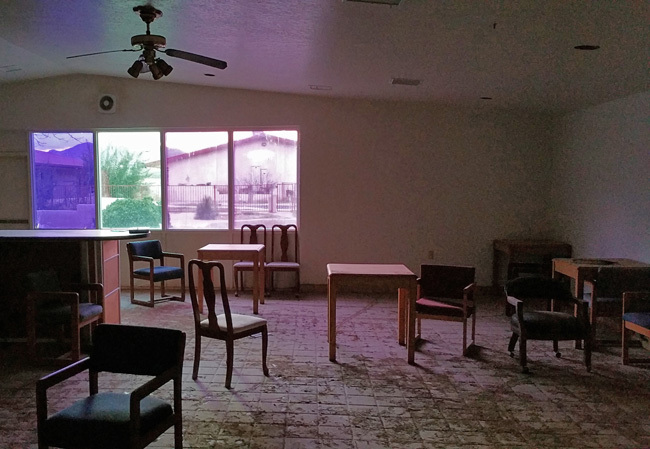 Weary travelers passing through Southwestern New Mexico can no longer find respite in the tiny community of Road Forks. 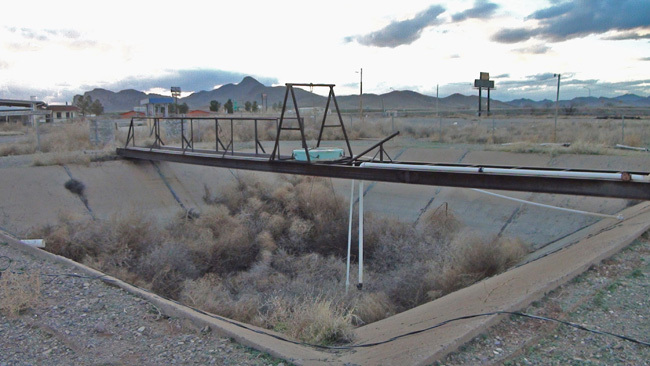 An oasis once stood at the intersection of I-10 and Highway 80, where you could pull off the freeway for fuel, lodging, and a hearty meal. The structures remain, but people no longer stop there, except to marvel at what has been left behind. 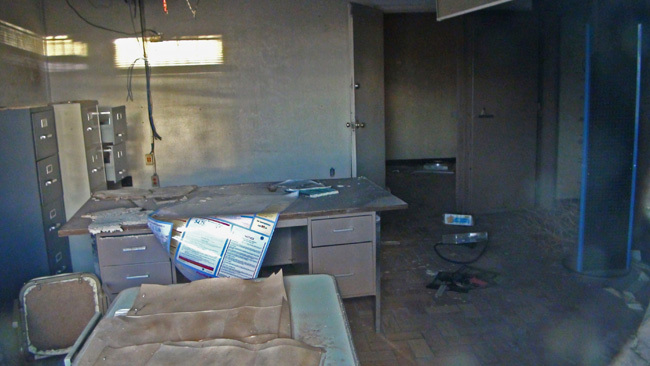 After exploring the desolate town of Willcox, Arizona, I thought I'd seen enough abandoned places for one day. I was mistaken. 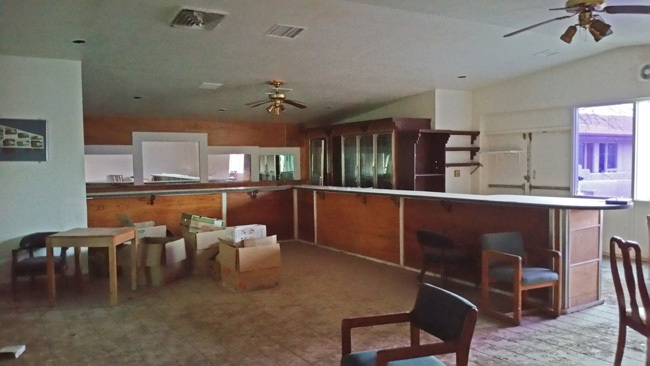 I happened upon a fantastic cluster of abandoned businesses purely by accident. 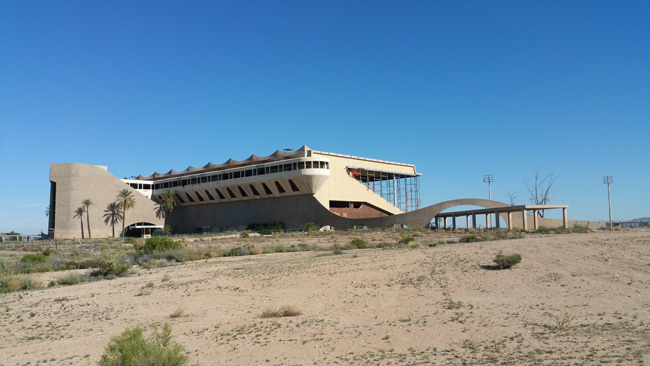 Five miles after crossing into New Mexico from Arizona, I exited the freeway, and there they were in all their abandoned glory: a massive USA Gas Station, Road Forks Mini Mart, Shady Grove Restaurant, and Desert West Motel. I'd hit the jackpot. The only business in the vicinity that was still open was a little fireworks shop. A thick chain held the mini mart doors closed, so I pressed my camera against the glass and captured a few pictures. 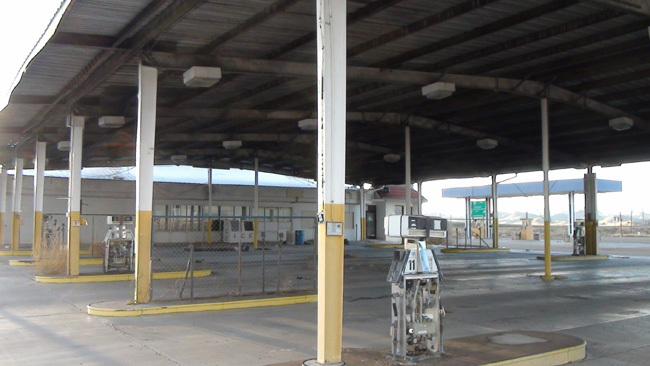 The fueling area was quite large with plenty of gas pumps in various states of disrepair. I imagine it was bustling with traffic in its heyday. 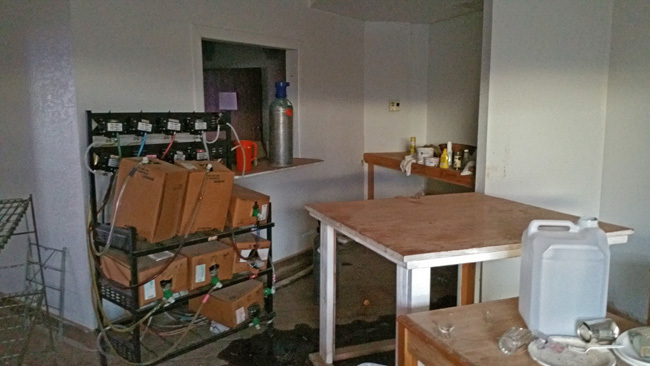 Shady Grove Restaurant was also sealed up tight. The windows were filthy, but I managed to get a few shots of the inside. In the back of the property a little car sat rusting. I'm not sure what the purpose of this contraption was. I can't say for certain when the USA Gas station / Road Forks Mini Mart / Shady Grove Restaurant closed, but this blogger mentions stopping at the mini mart for a cappuccino in November of 2010. 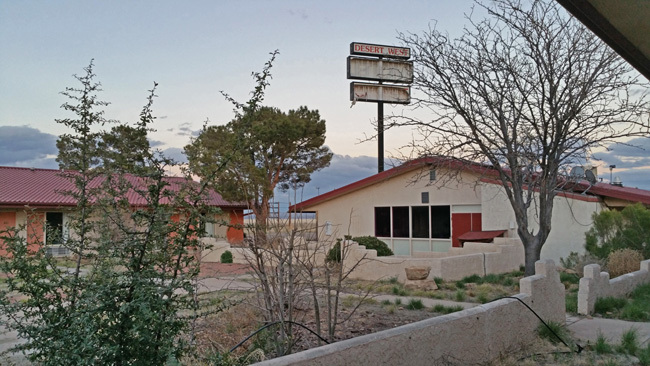 Directly across the street sits the abandoned Desert West Motel. The front door was wide open and nothing was locked, so I walked right in. The main building was a lot of fun to explore. 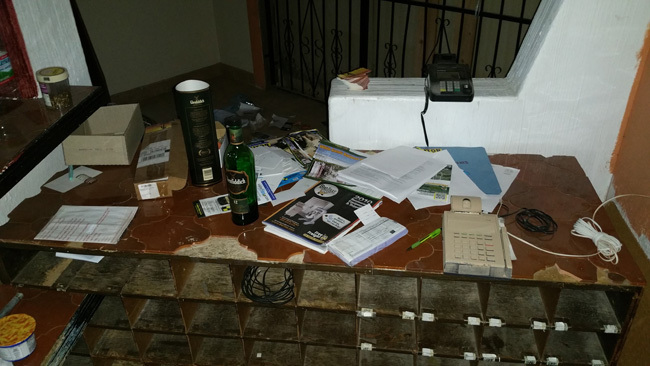 The reception desk still had quite a few artifacts. 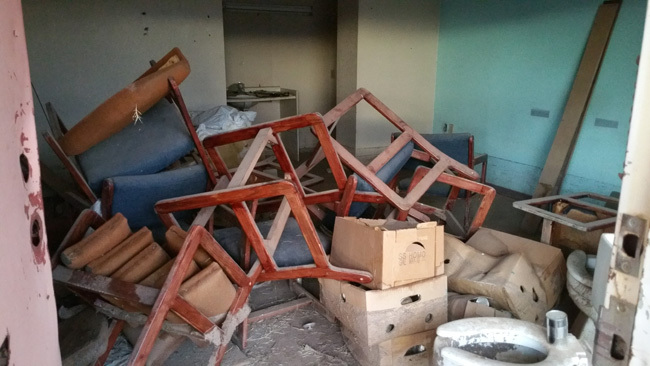 Furniture remained in the dining area. The syrup for the soda fountain hadn't even been removed. 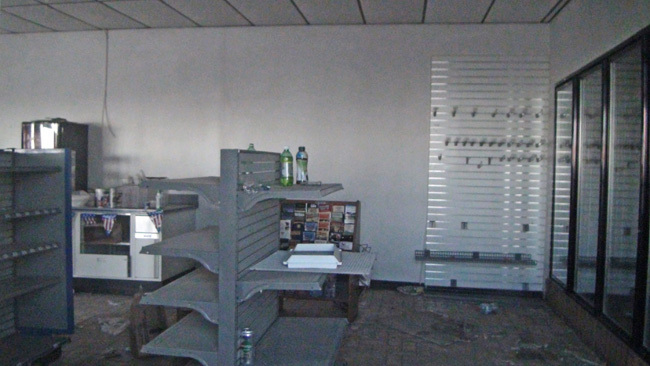 The back office still contained security equipment and files. 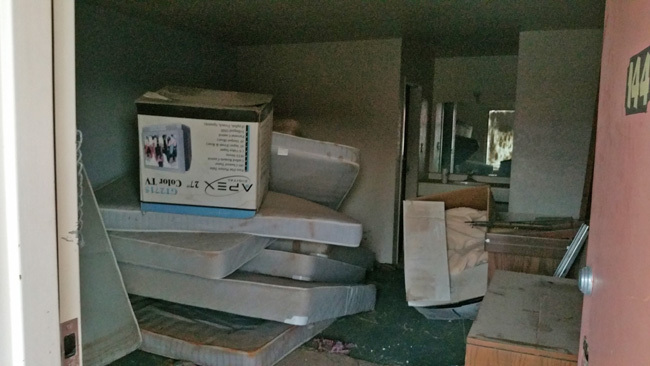 There was also a large suite, where I assume the manager stayed. 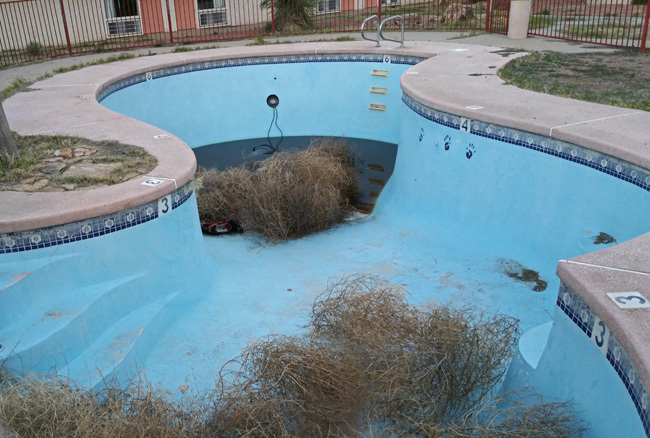 Out back is a lovely courtyard featuring a pool collecting tumbleweed. 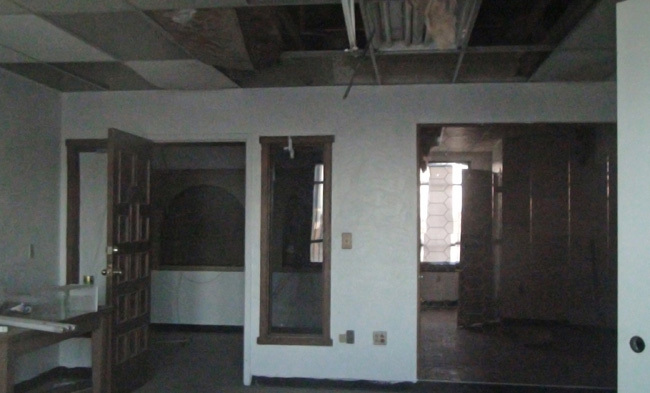 The other buildings were mostly guest rooms, which were fairly trashed. 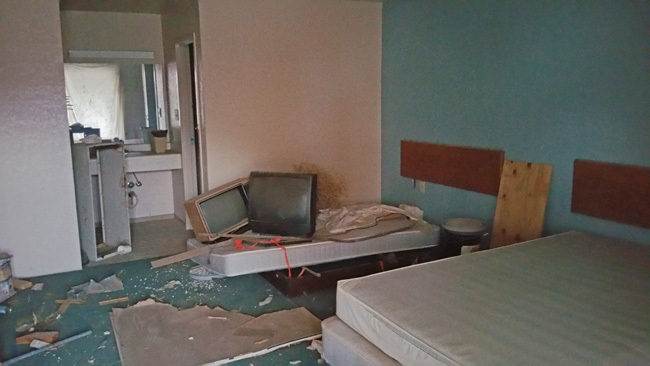 It looked like some effort had been made to clean things up, or at least consolidate items in the unused guest rooms. 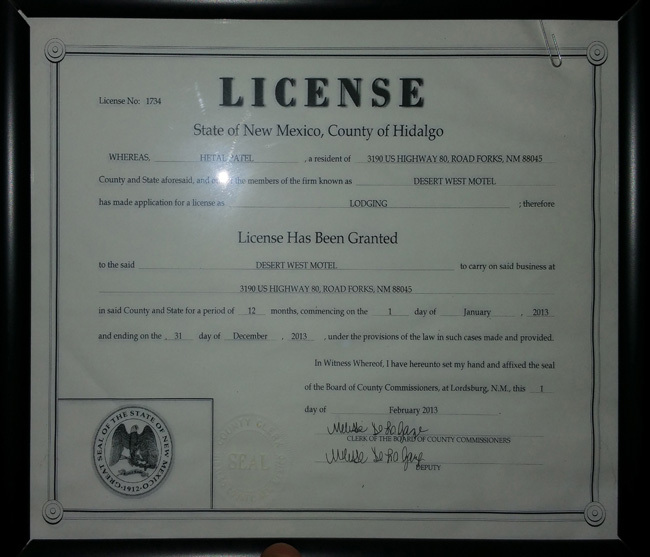 The business license hanging in the lobby was valid through 2013, but I can't say for sure whether or not they stayed open until the end of the year. 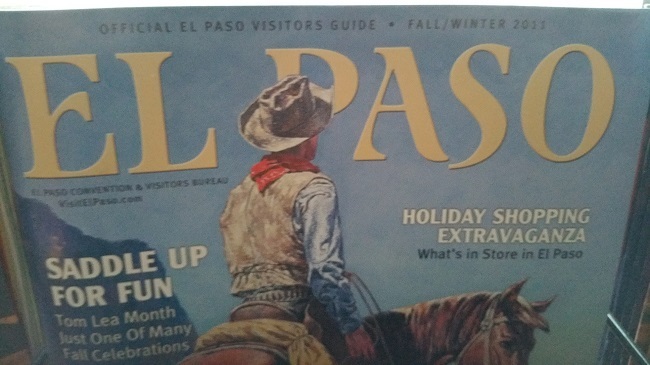 They must not have updated their reading material very often because the magazine rack in the lobby contained an issue of El Paso Magazine dated fall/winter 2011. 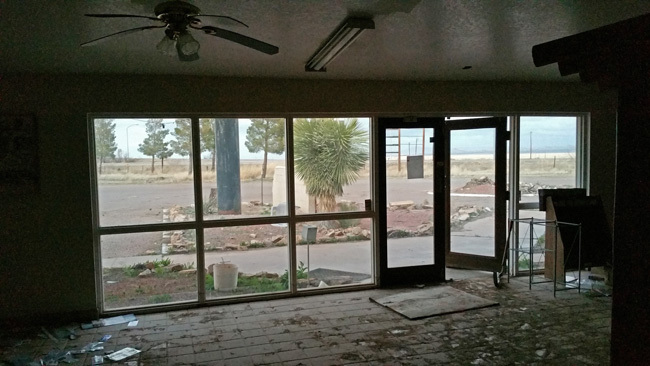 The Desert West Motel and Starvin Marvin's Restaurant and Grill was open March 2009 under new management. 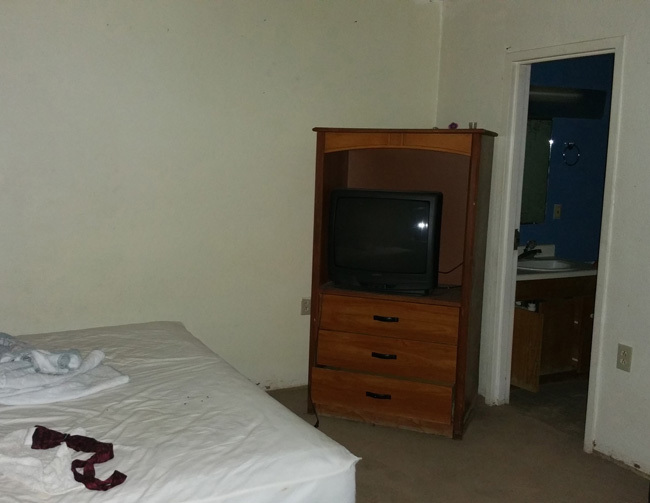 We have newly remodeled rooms with amenities to include free hi-speed internet, microwave, fridge and a beautiful outdoor swimming pool. The few reviews I found online were mostly negative, and the most recent was from 2013. Several guests said there were no other visitors at the time of their stay. 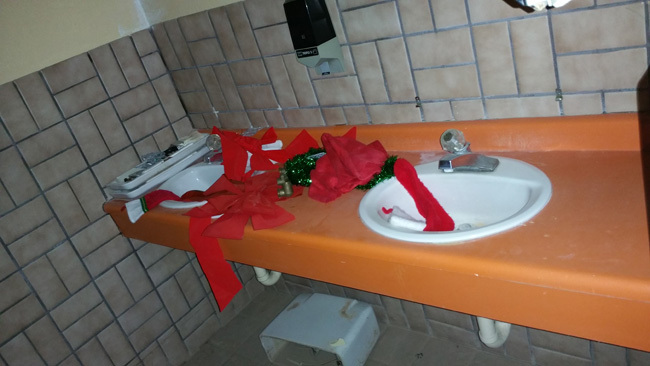 Some also reported that the above mentioned Starvin Marvin's Restaurant was closed. With so few guests it must have been difficult for management to justify the cost of keeping the restaurant open. 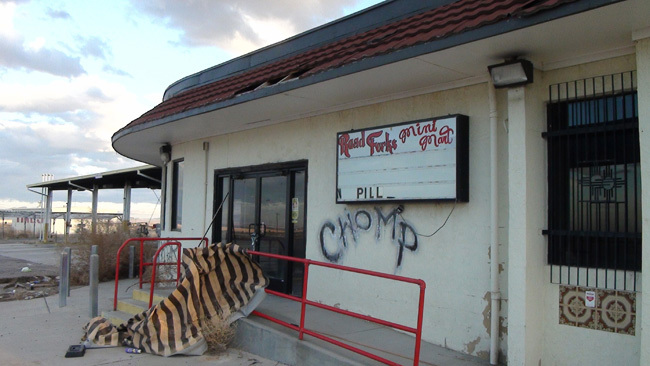 It is sad to think about the shattered hopes the new management had for the place. 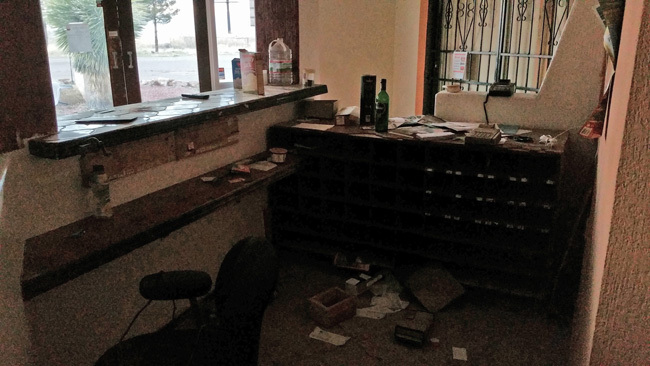 Thank you for reading, and please come back next week to see and hear about New Mexico's incredible Pueblo ruins and a few other more recently abandoned places. I'm always struck with the sadness of these places that people pinned their hopes on. Must be extremely difficult--pouring your money into a place and then watching it all collapse around you. So true. It must be devastating. I often wonder what the people are doing now and whether they went on to pursue other business ventures, or if they are still buried in debt and crushed by the trauma of disappointment. Do you have any interesting stories from when you lived there? It must have changed quite a bit since then. Roy? what year did you live there? And I have a "vase" for a Person that used to live there. I was to hold it for her until she returned to Mesquite Texas. Have had it since 1988 and I have had not luck finding her, I wonder where the county seat is and then they might be able to locate her. Any leads can be sent to wilsonperformanceparts@hotmail.com family or person will know the trucking company which no longer exists today. Hey my name is Scott McKinney i lived there in 1988. 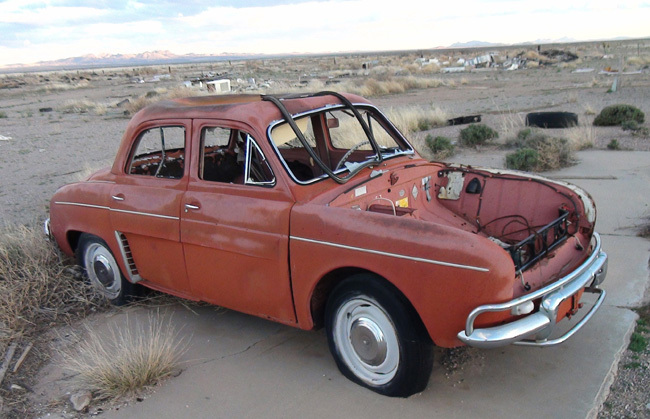 Hey Jim, that little car is Renault Dauphine and it was the best-selling import car of 1959. They were pretty cheap and comfortable but very unreliable. In fact, so many of them were breaking down so often, that the manufacturer was apologizing for this whole model line a few years later. 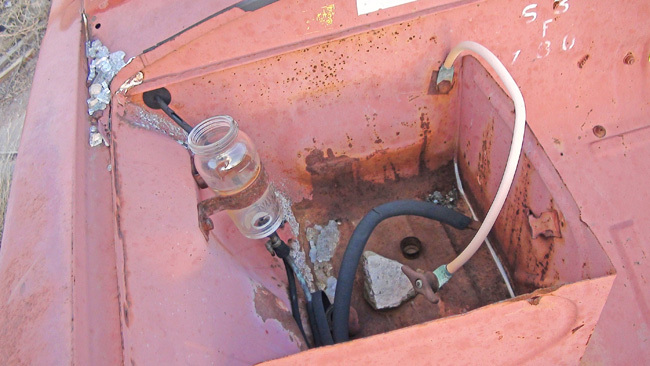 The glass bottle you see in its trunk (the engine sat in the back) is a brake fluid reservoir. I used to stop there on my way to Texas in the mid to late '90s, but haven't been by there in years. I was stationed in Arizona at the time. Maybe the Love's truck stop in Lordsburg was too much competition. BTW, the motel still has an operating website. I used to live in Road Forks with family who owned a portion of the truck stop, bar and motel. It was a fun place to live. I swam in that pool as a kid, hung out in the bar and worked shortly as a waitress. I still have a Shady Grove Restaurant Menu I saved. Inside the truck stop was an arcade, gift shop, salon (for a bit), shoe shine, post office, store in the back for truckers and of course the restaurant. I loved their salsa and chips and they had great corn bread. Last time I visited there back in 1999, I stayed at the Desert West. I had fond memories of that place. It was a bustling back in the 90's. I will miss you Road Forks. Thank you for sharing your memories of Road Forks. I wish I could have seen it during its heyday. It sounds like such a nice place. 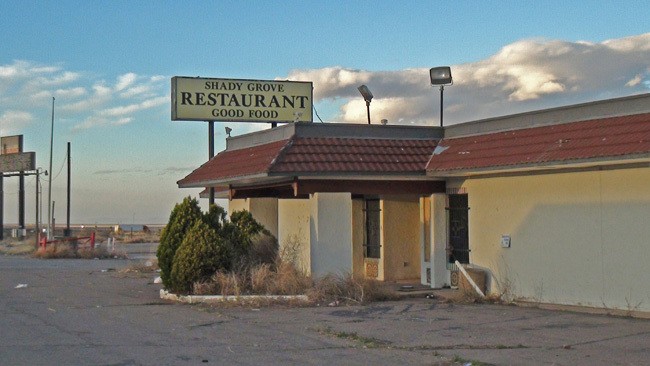 I'm glad you held on to a menu from Shady Grove Restaurant. It's nice to know that you're helping to preserve its memory. I've been there. I remember when it was still a functioning restaurant. Nice! I would like to have seen it when it was still open. I was stationed with the border patrol in the national guard that area 2006-7 timeframe. It was still open and doing a good business in those years. Oversize /permit loads may not take the interstate accross there to or from El Paso, so they have to detour down state route 80 thru the backwoods desert. So that's a natural stopping/ fueling point. Also at that time the deeming truck terminal in deming was still open and doing a good business. ( halfway point between El Paso and Tucson supposedly) when the new petro travel plaza/ stopping center opened up just outside of deming, it put both of these older more traditional/ independent truck stops out of business. Thanks for the info. I wasn't sure what might have caused this place to close. It's sad when big businesses come in and out-compete independent businesses. It was a good place to live. I liked the Grahams Jane, Judy and Johnny They were good people. I had a lot of fun living there from 1970 to 1973. I hope they are doing well. I miss living there. Cool! Thanks for sharing your memories. It used to be a "goin' jessie" for a while. People would holler "Watch out the cow haulers are comin' in". Get 3 or 4 us together & it was a wild time in Shady Grove. I stopped at this exit to visit the phantom fire work shop and immediately noticed the abandoned motel and is gas station. I love places like this. I wondered what the history of this place was and I googled the name and found this site. After reading the posts in here I was able to learn the history and read lovely stories about this place. Thank you all for the history and unforgettable memories you share with people like me. 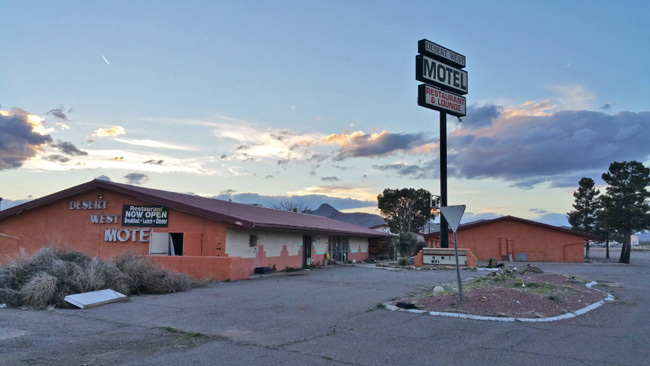 I do have one question: on my way back into new Mexico I wanted to roam around and maybe go into the motel and motel tavern to take pictures. Is this illegal to do and could I get in trouble if I entered the buildings. For some reason I feel connected with this place. Thank you for your time. I lived and grew up in cotton city about 14 or so miles from road forks. I remember my mother worked at the restaurant as a waitress. Oh my the fun those waitresses had.. I remember Freda another lady waitress they all joked around it was constantly hopping back in the days. With the arcade game room, shoe shine, hair cuts, gift store, big place where it was a truckers dream to go buy everything it had anything they ever wanted, a radio shop and of course the wonderful restaurant. They had a bar across the road didnt ever seem it was empty either. Constant semis gasing up and convenience store there on site plus another store across the road. Semis and cars parked everywhere people sleeping or enjoying the views. Not far away is the beautiful mountains. Had a tire shop also... What a dream it would be to reopen it.... Love it back then. Sounds like it was a great place very full of life. Thanks so much for sharing your memories! Stopped there in April 2017 and took pictures outside, didn't take any inside. Nice to hear some of the history from people that were there when everything was still open. I lived there From 1970 until 1973. I worked as a bus boy in the restaurant for Jane (Graham) Coogan. My brother Mike worked for Johnny Graham in the truck stop. When I was young we traveled from our home in Kansas to New Mexico and Arizona often. My Dad trucked through there a lot and had many stories of the people and places along that Highway. Interstates don't compare to the roads from that era because you just fly by and don't stop to smell the roses. I agree wholeheartedly. Road trips are so much more fun when you have the opportunity to experience places up close. Freeways are good for if you're in a hurry. Who's the owner of the restaurant now .? I’m always seeking Abandon places to explore. Back in 2005, I Stopped at that gas station for a Soda, and it was pretty nice then. Sad to see these places go out of business, and seems to be more of it happening. Yes, the newer chain travel plazas put most of these kind of places out. Truckers changed and a new breed of 'people driving trucks' wanted fast food and all the comforts of gaming and such that old-school truckstops did not offer. You readers can visit the Doswell Truckstop over in Doswell, Va (exit 98 on I-95) and you can see the same happened to them. Another is the Stateline Truckstop up on I-90 in West Springfield, Pa, and so on. I always stop at Flash Foods at Harriets Bluff on I-95 about exit 7 in Georgia. Its not visible from the interstate, but still open and has lots of truck parking. It was a beautiful truckstop when it opened and had friendly people with hot 24 hour full deli meals (meatloaf, mashed potatos, pies, hot vegetables et). 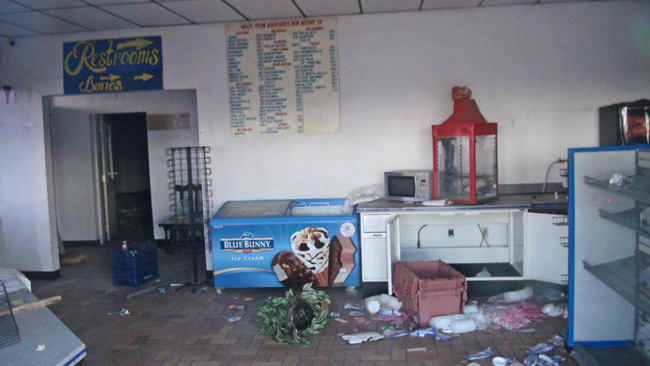 When the mega chain plazas came on the scene it went downhill. Partly because the stockholders don' want to put any money in it. 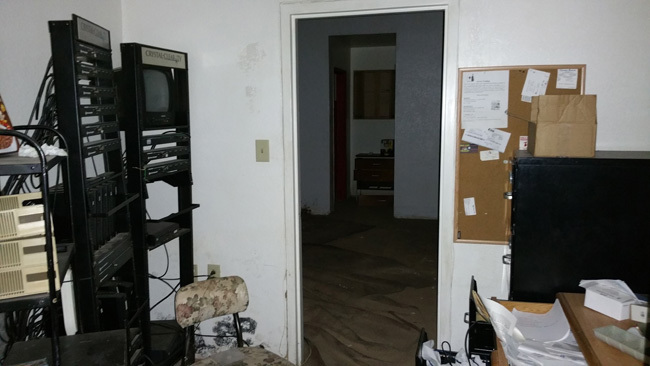 Theyhave free showers but the Cat Scale is gone and its junky looking because they allow a repair shop to operate in the back and it ruined the look of the place. Anyhow, it was a nice quiet place back in the late 90's. I prefer the small dirt lot and ma and pa stops simply because they are not full most of the time and I am not tied-up with unprofessional 'people driving trucks' that can park and cant drive getting into them. Anyone remember Carl's down in Carl's Corner,Tx.? Ted's out in Arizona? The Big K up in Kingsville, Ohio, the Green Shingle in Sterritania, Pa.? I loved reading the 08/24/2017 posting because the waitress Freda (actually spelled Frieda) was my mother. She worked there for 17 years and I have many fond memories of going there as a kid. My very first job was working as a dishwasher in the restaurant. It was a bustling place in its heyday. I trucked from the east coast to California all through the 80’s 90’s and into the 2000’s and would stop there just about every trip. It was a good place to fuel up, eat, shower or spend the night. If I had the time or ran into a truckin friend we might park there for the night and go across the road to the bar and flirt with the waitress if it was a weekend. Spent a few nights in the Desert West motel over the years it was a nice place back in the day. I spent most my life trucking all across America and have fond memories of other places just like Shady Grove. Tucumcari Travel Plaza in Tucumcari,NM is another shut down truck stop that in its heyday was a great place to stop . There are a lot of other good o’l places that are gone forever. I lived in Road Forks back in the 70's.I was 15 years old. I worked as a waitress during the summer. I met my future husband there. He also worked there. It was always busy there especially at the restaurant. There was also a mobile home park there for the employees. Its hard believe it's all gone.